What method of loading a 1911 platform 45 gives the best first shot performance? Sling-shooting an open slide, loading on a closed slide and then sling-shotting, something else? I'd like to get the first one into the group with the rest. Not trying to be rude but I can't imagine it would matter. It is probably the oil that was in the barrel that is giving you a problem with the first shot. Unless your talking about every first shot of every string. Then I don't have a clue. I ask due to researching Ransom Rest test procedures and finding an ammo test report on the old Bullseye-L list where the groups were reported with and without the first shot. As for my own first shots being out of the group, I'd blame the grip nut first, but after reading a few reports of the phenomena while testing in a more controlled environment I raise the question. Try both, and see which works for you. The more you make the first shot like the rest, the better the group should be. I'd try slingshot on a seated mag. Reload before the fifth shot when shooting slow fire. Before testing any ammo,pistol or rifle for group I always throw a round down range to "clear the throat". Basically what that does is clear any excess cleaning oils out of the barrel and off the action and pre-heats the barrel. Just a lifetime habit. Doing that however does tend to eliminate the first round flyer. I have never given a thought to treating the first round different out of a 1911. I always use the slide release to chamber first round. Autos are made to slam forward. I am sure you will get a variety of responses to this. I was getting first shot fliers on my slow fire right up to Camp Perry. A good friend and High Master sat me down after prelims and we went through my shot process step by step. The culprit was that I was dry firing before loading the mag. When I loaded the first mag the slide was closed and I was hap hazardly loading the first round. Now after I dry fire I lock the slide back, insert the magazine and trip the slide release. First round fliers have disappeared. So in my case it was how the round was chambered. DeweyHales wrote: Try both, and see which works for you. I have to ask if you mean load on a open slide and slingshot a round from the magazine, or load on a closed slide and sling shot a round from the magazine. I've been changing magazines after round four ever since some more experienced folks pointed that out to me. I try to harness laziness as a power for good, so I find it easier to study proven practices than try to re-invent the wheel. can you legally fire a extra round down range when you start slow fire to clear the oil or season the barrel? The term for that is "Innovative Efficiency"
Dave Salyer told me that the first shot with jacketed bullets is often outside of the remainder of the group. I have taken to running a patch wet with Hoppes #9 (aka "goddess perfume") down the barrel after cleaning it thoroughly. First shot is almost always on call. Granted, oftentimes the call is, "Good God, COME BACK!!" Deerspy wrote: can you legally fire a extra round down range when you start slow fire to clear the oil or season the barrel? In a match it's not legal to fire 11 shots. The command is to fire 10 shots in 10 minutes. You can do almost any combination of rounds and loading that you want, but you may not shoot 11 times. OldMaster's comment is about ammo testing--not match shooting. I also fire some fouling shots prior to machine rest testing. I also always drop the side by tripping the slide stop and letting it slam home on the 1st round in the magazine. I find it to be as accurate at when the gun does it under recoil. Coming out of the Military National Match Marksmanship Team system starting in the late 70s, I can tell you that if you tried this flim flam sling shot method at any of the service matches you'd not have to worry with where your first round went. I thought it would be illegal, I always shoot some fouling shots with 22 at home but don't have bullet trap that will work with 45 it seams like my 22 works better after fouling shot and I think my 45 does to but hard to prove? thanks not trying to hijack! I'm picking up that competing with a clean barrel isn't a good idea, but it may be separate from the first-shot-out-of-the-group problem. Axehandle wrote: Coming out of the Military National Match Marksmanship Team system starting in the late 70s, I can tell you that if you tried this flim flam sling shot method at any of the service matches you'd not have to worry with where your first round went. Could you expand on this? Were you trained to release the slide with the slide stop? No snark, just an honest question. As an aside, most people call the part a slide stop and not a slide release. The name implies the proper use. Not "trained to use the slide stop." We were required to use the slide stop to release the slide. There's a lot to this.. and has been the discussion / study of a few smiths for some time. The cartridge must be stripped and chambered from the magazine with the same force, and direction each and every time. Variables, such as chamber dimensions, frame / barrel feed ramp angles, disconnector camming ramps, magazine spring tension, mag release points, polish and reduction of friction areas. I like to say that, " The gun should feed, feel and sound, as if the slide is dropping on an empty chamber." In a 2700 match, there will be a minimum of 6 long line chamberings from lock back. I train and encourage the magazine change at shot # 4 in the 10 shot string, which eliminates a lock back. I set up a spotting scope during RR testing, and watch each bullet pass thru the target.. There is much to be gained from the attention given to the above modifications.. Improved fitting procedures, and attention to these details, have brought the groups to where they are today.. Somewhat controversial with the martial artists and LE, but the sling shot method, is in my opinion, the least desirable method of slide release. It's never consistent, very slow to execute, increases the potential for a misfeed, and requires to much physical motion. Great responses. 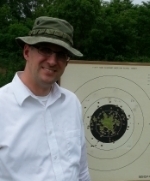 I started shooting two years ago after taking an NRA Basic Pistol course due to wanting to start with formal instruction, and later worked with a coach for Mens Air Pistol, and the subject wasn't covered. I had noticed on the CMP Bullseye video "Mind Over Matter" the slides being released with the slide stop/release but hadn't chased the idea down. As with everything else with target shooting, it looks like getting the details right every time will lead to higher scores. Sa-tevp wrote: I ask due to researching Ransom Rest test procedures and finding an ammo test report on the old Bullseye-L list where the groups were reported with and without the first shot. If the question was more about ransome testing, then what I found in many testing's is to start each test with a clean barrel, after the gun is in the machine, fire a few settling rounds and then fire 4 for group, change mag and fire the last 6, you will get better groups, if testing multiple loads, always fire at least one round, before firing for the group shots Or forget the 1st, and use the 9 shot group. I have always sling shotted from an open slide cause it is very consistent the way I do it. I did change my long line shooting a few years ago from watching and talking to Steve Reiter that I shoot next to out here in Phoenix quite often. One day at a match or practice match I was to his right, we are both right handed and watched as he loaded a new mag into his .45 while his slide was not locked back. Did not think much of it and asked him what that was all about. Well, come to find out, he shoots 4 shots and reloads with a fresh mag and continues. Been doing the same thing ever since. Never had a problem and no need to change now.